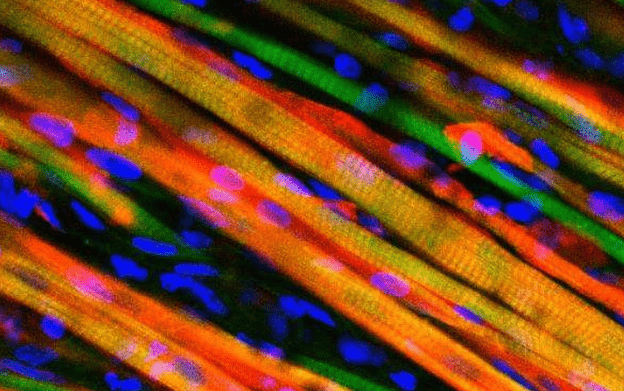 Heralded as one of the biggest advances in the field, scientists at Duke University have engineered muscle tissue that is up to ten times stronger than anything previously achieved. The muscle can contract similarly to native neonatal skeleton muscle and, most importantly, it demonstrates self-healing ability – again, just like the real thing. To demonstrate their work, the researchers also implanted the muscles in bionic mice and followed the muscle fibers as they grew through a window on the back of the living animal. Artificially creating muscles is a great challenge, but if muscle implants are demonstrated in humans, then a slew of injuries or degenerative muscle diseases could be addressed therapeutically. The team led by Bursac found that the two most important aspects that need to be considered when engineering muscles are the contractile muscle fibers and a pool of muscle stem cells, known as satellite cells. The latter is of significant important in all muscle carrying organisms. Your muscles has many, many such satellite cells layered around them, waiting in standby until they’re efforts are required. For instance, when an injury occurs to the muscle, like those following a car accident or even a hefty workout, the satellite cells activate and begin the regeneration process. The key to the team’s success was successfully creating the microenvironments—called niches—where these stem cells await their call to duty. First, the researchers ran a series of trials on the muscles in the lab, submitting it to electrical impulses. The muscle contracted showing strength 10 times greater than anything demonstrated in a lab previously. Then, the muscle was damaged using snake venom and satellite cells activated, proving their environment can help the muscle regenerate. Then followed the trial on mice. The researchers inserted their lab-grown muscle into a chamber in the back of mice and implanted a window to follow progress. The evolution turned out to be spectacular, as the muscles proved to grow stronger as the days and weeks passed by. To make things easier, the muscle was genetically engineered to express fluorescent flashes during calcium spikes—which cause muscle to contract. The ultimate test will follow next, as the researchers need to investigate whether or not the biomimetic muscle can be used to repair actual muscle injuries and disease in humans. The findings were reported in the journal PNAS.